The 2-year effort to return to running after my stroke certainly tells a compelling story of patience, persistence, and perseverance. But the story reveals more. The effort validated rather definitively a new way of thinking about stroke recovery that has been formulating in my mind over the past two years. Begin by viewing the video below which documents my journey from not being able to stand up from the mat in inpatient rehab to returning to running. Traditional stroke recovery thinking can be represented by the common phrase, “If You Can’t Walk, Crawl.” In the stroke recovery world this translates into, if the insurance, governmental, and professional resources are not available to get the stroke patient to full recovery, then let’s set the goal to a minimum set of Activities of Daily Living (ADLs) to get the best result for the extremely limited resources for recovery that are available. My experience and the latest research reveal the traditional thinking embodied in “If You Can’t Walk, Crawl” is dead wrong. The new thinking is embodied in “If You Can’t Walk, Run”. In the stroke recovery world this means if you are falling short on recovery, you need to do more, not less. There are two dimensions to doing more as a response to limited recovery, 1) Post-Stroke Exercise, and 2) Post-Stroke Neurology. Physical, Occupational, Speech, and Recreational Therapy following a stroke certainly are a lot of work. But beyond those sessions, just about everything else the stroke survivor experiences emphasizes how fragile you are and how at risk you are if you move. Since you feel like you were hit by a train, in the early days this is an easy proposition to accept. The inactivity, nutrition, medications, and the realities of an inpatient hospital setting only make you more prone to being sedentary. Facing new and consistent research results on post-stroke exercise, the American Heart Association (AHA) and the American Stroke Association (ASA) have revised the standard of care and are now recommending aerobic exercise as soon as practical after a stroke. I was particularly fond of swimming. Although early on, I needed a floatation suit, flippers, a snorkel, and swam mostly using one arm, it was a great aerobic workout where there was no fear of falling, getting hurt, or overheating. A better sense of just how undesirable it is to not be exercising regularly can be seen in a new comparative study that found, “Physical inactivity ranks higher than smoking, obesity, or high blood pressure among the causes of heart disease in Australian women older than 30 years, a new study shows.”  That’s right, sitting in the recliner all day is more dangerous to your health than smoking. 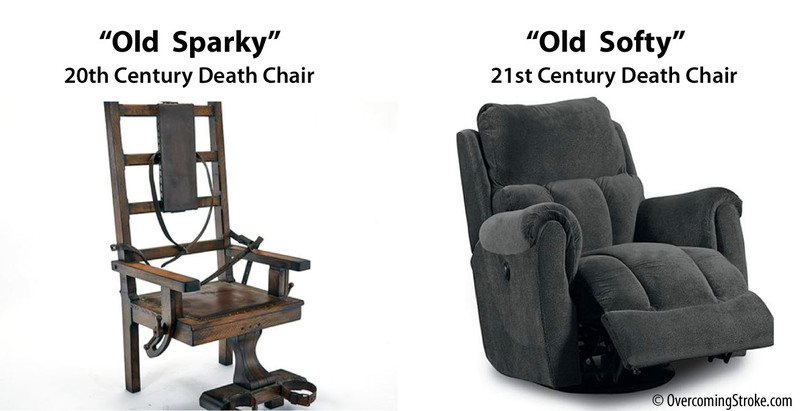 The Electric Chair “Old Sparky” – 20th Century Death Chair. The Recliner “Old Softy” – 21st Century Death Chair. Inactivity is more dangerous to your health than smoking . Detailed post-stroke exercise information will be the subject of another article, but there are a few fundamentals that should always be kept in mind. First, the type, extent, and form of activity in a new exercise effort should be developed relative to your current efforts, not anyone else’s efforts or program. If you have been completely sedentary, then spending more time simply standing instead of sitting is a good beginning to an exercise program. I remember an hour in PT sitting up on a mat trying to get my thumb to move. During this effort I became as exhausted as when I was competing in a 50-mile triathlon a few weeks earlier. It’s all relative, not to what you once did, but where you are post-stroke when you started exercising. Focus on moderately and steadily increasing your weight bearing and movements relative to your previous level. Constantly monitor and track your heart rate, blood pressure, and oxygen saturation. There are now readily available, low cost consumer devices available to monitor and track these metrics. There are even apps for your smart phone with plug in devices that will do this for you. These metrics should be closely monitored for compliance with the target provided by your doctor. Get a personal trainer. They will keep you in the right posture and movements to minimize soreness and injury. Most people fail to stick with exercise programs because they hurt something. This typically results from doing the movement wrong or overdoing it, both things personal trainers are specialists in preventing. Trainers can also help you stay motivated because you inevitably develop a relationship with the trainer where you don’t want to disappoint them. Visit your doctor to get guidance to determine the right starting level for exercise and to get the target numbers for your heart rate, blood pressure, and oxygen saturation. Doctors are generally very conservative about post-stroke exercise even though it is now part of the AHA and ASA recommended standard of care. But it is OK to start out slow. What’s important is that you get started and steadily progress relative to your own starting point. The phrase “If You Can’t Walk, Run!” is not meant to be motivational.It is a way of thinking. For example, it means if you want to improve your post-stroke walking, you need to run. One year and a half of continuous traditional physical therapy allowed me to progress to what could be considered a best-practices outcome. I could walk very slowly and without a walker or cane, and ultimately did not need an ankle foot orthotic (AFO) or special shoes with a slider plate on the front sole of the affected side shoe. But it was obvious I had a stroke and it obviously fell quite short of my “Like It Never Happened” recovery goal. Walking gait improvements seemed to have stalled for several months. However, once I was able to run, initially using the AlterG Treadmill, then later outside, my walking gait started to quickly improve. After 3 months of AlterG and outside running, my walking gait and speed has improved dramatically. I now see that my ability to walk in such a manner as to not reveal I had a stroke is well within reach. Of course the year and half of traditional physical therapy supported by steady and progressive fitness and weight training, was critical to rebuilding the muscles and neurons, and mitigating tone, that made use of the AlterG even possible. My excellent results with the AlterG seemed contradictory with other disappointing results in the literature of prolonged gait therapy using harness supported treadmills. My experience is that the harness-supported treadmill is therapeutic and essential very early in the recovery when just starting gait recovery, especially with facilitation. 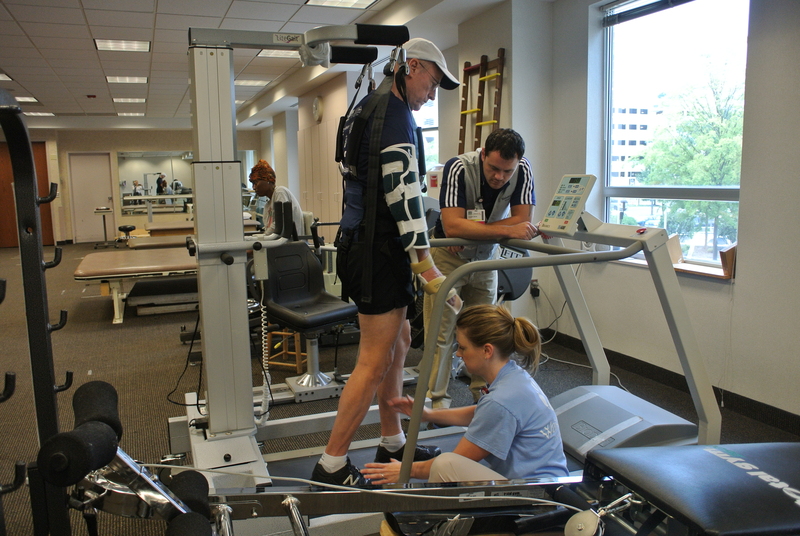 Facilitation, where the therapist stimulates movement of the leg, is currently not practical on the AlterG due to the treadmill platform being enclosed in the pressure envelope. A deeper look into the neurology reveals why the AlterG was effective in improving walking gait and enabling run gait whereas the harness-supported treadmill was much less effective. The first indicator was the observation that once I was able to break into a run gait, the resulting gait was 90% of my pre-stroke run gait right from the start. I believe the only reason it wasn’t 100% was due to residual weakness in my calf muscles limiting my ability to push off. At the same time, after a year and a half, my walking gait was only 50% of pre-stroke gait. This is evidence of the powerful adverse effects of compensations developed early in therapy, despite every effort by the physical therapists. Since I had not been able to run until I could run using the AlterG, there was no opportunity or need to develop gait compensations. Living with one of my therapists (my wife), meant the battle to prevent the development of gait compensations was waged every waking moment we were together. Also, my wife would not allow me to use a cane, which prevented me from developing some of the more intractable compensations, such as shifting my perceived center of gravity. Despite this unusual situation where gait compensations were addressed with unprecedented diligence, I still developed gait compensations. This is strong testimony to the disruptive influence of your natural desire to get walking absolutely as soon as possible, even if your body is not yet sufficiently recovered to do it properly. Gait compensations are not the only reason it’s hard to get back to a pre-stroke gait. The powerful natural response to your instinctive fear of falling reflex can also inhibit gait development. The new neuro connections you are building are fragile and very easily overloaded and misdirected. The instant you trigger the extensive imminent fall protective mechanisms, your new neuro systems become overloaded and your ability to control complex activities like gait greatly diminish. I found the harness was not able to provide the feeling of confidence necessary to repress the fear of falling reflex. Also the harness pulling on the torso created substantial additional neuro inputs that contributed to the neuro overload. 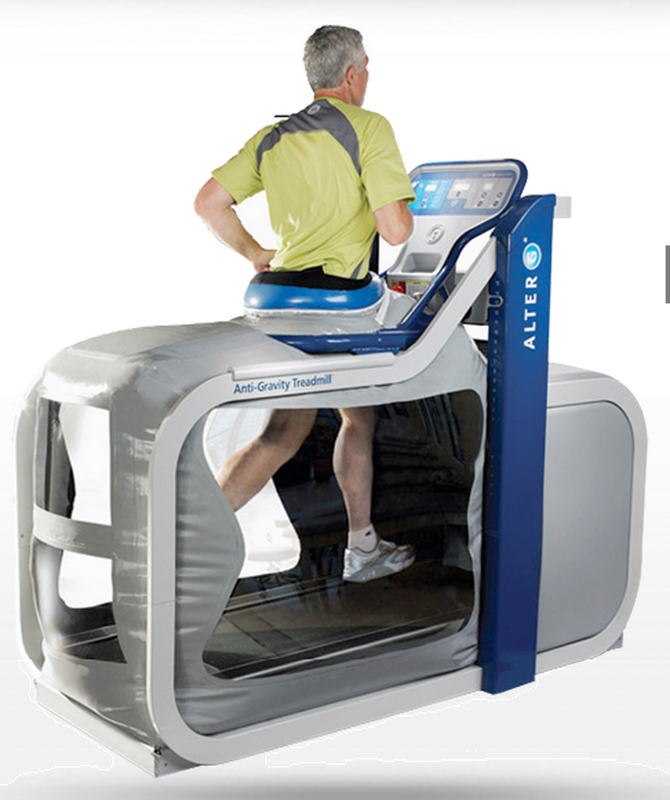 The AlterG treadmill supports you at the hips on a cushion of air that is almost imperceptible. The fall reflex quickly disappears and there are no additional harness inputs contributing to neuro overload. This method of support also stabilizes the pelvis preventing one of the most common forms of gait compensation. The cumulative effects of the AlterG support systems are you can really concentrate on getting your gait right. Also, facilitating repetitive rapid movements, such as running, helps reduce tone in the leg, minimizing another limiter of proper gait.